Finding the right job in a new country can be a challenge. These pages aim to give international spouses advice and exercises on what to consider when starting a career in Denmark focusing on skills and networking. Use the step-by-step guide and the information below to uncover your skills and job goal areas in order to plan a systemized and successful job seeking process to get you into the Danish labor market. You can go through the model step by step below (in a vertical edition). The Job Goal Area Model is developed by JUNGE, Charlotte Junge and Aarhus University, Vibeke Broe as part of the project "Retaining Talent in Denmark". The project is funded by "Styrelsen for International Rekruttering og Integration (SIRI)" and involves Aarhus University, AU Career, and International Community. The better you target your job goal areas, the more likely you are to succeed. Skills: what are your strenghts? Knowledge and interests: what do you know and like? Personality: who are you and how do you like to work? 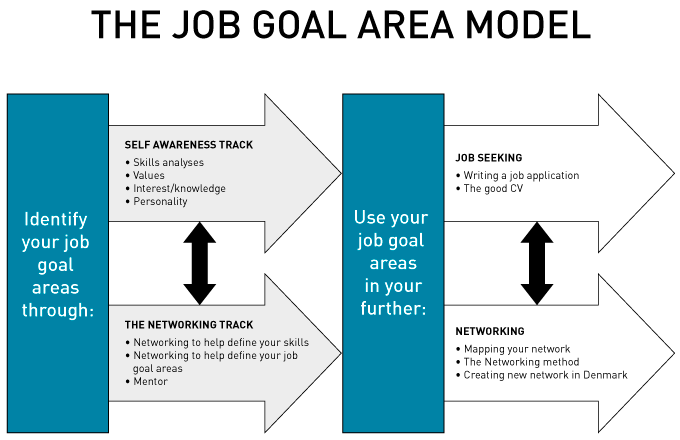 By now, you have your job goal areas and can use them in your further job seeking and networking.